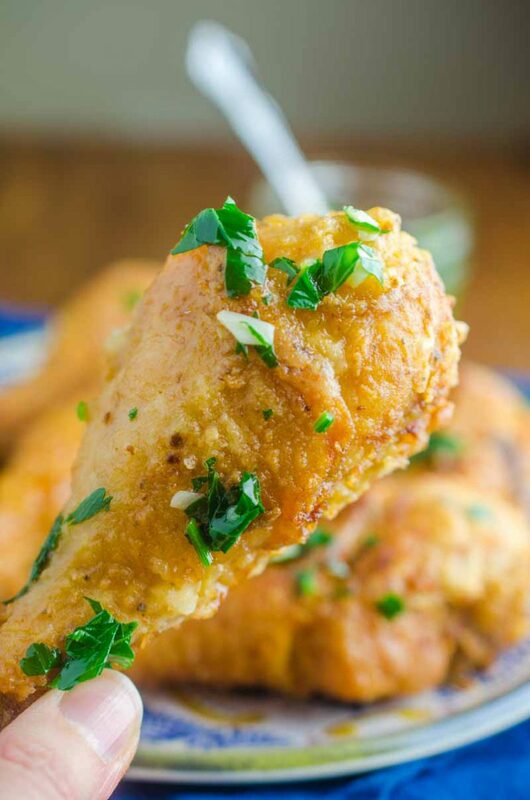 Dry rubbed with garlic and drizzled with garlic oil makes Garlic Fried Chicken a hit with all garlic lovers. It’s crispy, succulent and perfectly garlicky. 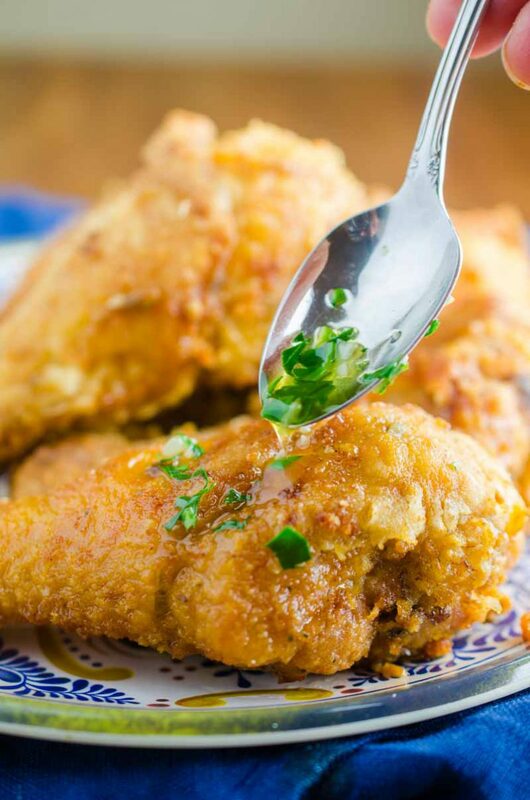 If you are a garlic lover, you are going to fall head over heels in love with this Garlic Fried Chicken. Winner. Winner. Chicken. Dinner. That is exactly what your family will say when you make this for them. 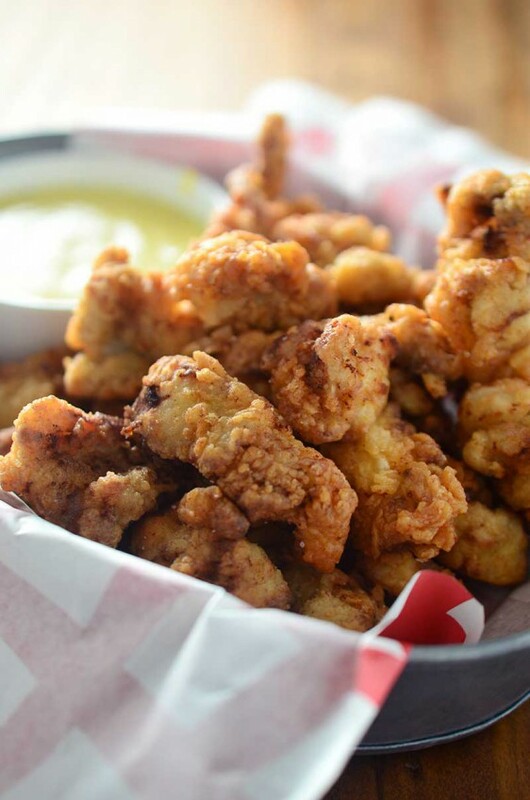 Garlic crispy goodness on the outside, tender and succulent meat on the inside. And the whole finger lickin’ good thing totally applies here because you don’t want to waste any of the delicious garlic oil that is poured over the top. One of my favorite meals ever is mashed potatoes and gravy, green beans and fried chicken. 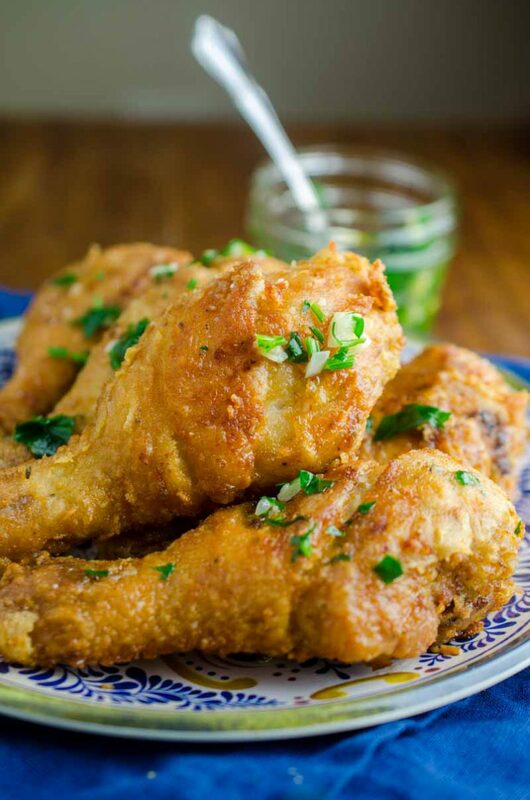 Especially this garlic fried chicken. 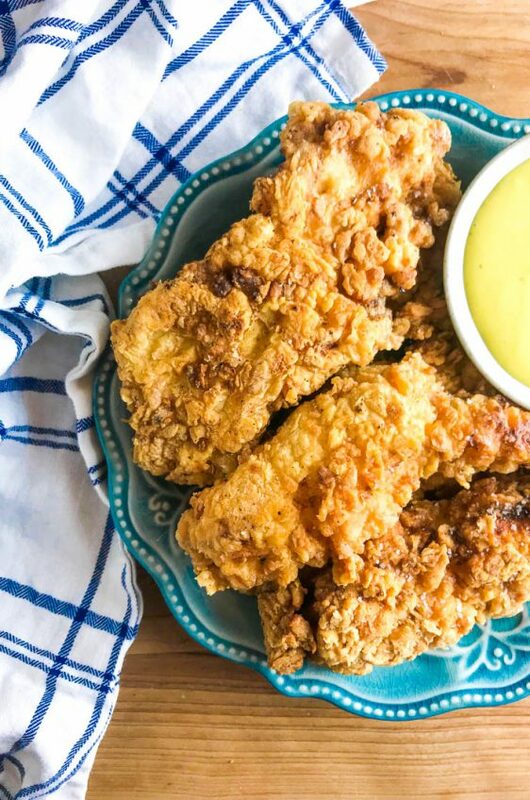 In my ever lasting quest to find amazing fried chicken recipes, I am always looking for different techniques. I read about a new fried chicken cooking technique a few weeks ago. The technique involves actually covering the chicken while it’s frying. This intrigued me because one of the hardest things about making fried chicken is getting the outside nice, brown and crispy while not undercooking the chicken. I was happy with the way that this chicken turned out. Actually really happy. Not only was the chicken perfectly cooked, the clean up was a lot easier too because cooking the chicken covered for the the majority of the time keeps the splatter to a minimum. You could use this this technique with any flavor of fried chicken I’m sure but I chose, because I’m kind of obsessed, to use garlic as the main seasoning in this dish. The chicken is simply coated with a dry rub of salt, pepper, paprika and granulated garlic and marinated for at least 4 hours. The longer the better. Finally when you’re ready to cook you simply dredge the chicken in flour. That’s it. No wet batter. No egg/milk wash. Just flour. And then fry until perfection. But the deliciousness does not stop there my friends. No, not at all. 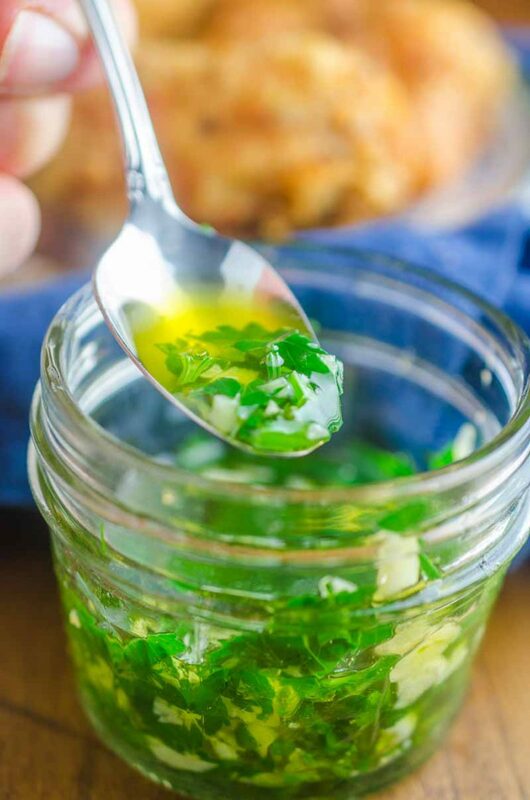 After you fry the chicken, you saute garlic in olive oil with a little parsley, just until the garlic is fragrant, and then pour that over the plate of freshly fried chicken. Combine salt, pepper, paprika and granulated garlic together in a bowl. Rub over the chicken. Cover and refrigerate for at least 4 hours, over night would be best. Dredge the chicken in the flour, coat well. Transfer to a plate and allow to set for 15 minutes. Cover a baking sheet with paper towels and place a cooling rack over the top. Heat 1 inch of oil in a 12 inch skillet over medium heat. Once the oil is hot lay 5 pieces of chicken in the oil, skin side down, and cover for 6 - 7 minutes or until browned. Turn the chicken and cook another 6 - 7 minutes. Remove the lid and cook an additional 2 minutes or until it is golden brown. Use tongs or a slotted spoon to transfer the chicken to the prepared cooling rack. Sprinkle with salt. Place in the warmed oven to keep warm while you cook the remaining chicken. After the rest of the chicken has cooked transfer to cooling rack, sprinkle with salt and keep warm in the oven while you make the garlic oil. Heat the olive oil in a skillet over medium heat. Add garlic and cook just until garlic is fragrant, about 30 seconds. Remove from heat and add in parsley. Transfer chicken to a serving platter and drizzle garlic oil over the top. Serve hot. Can this be done with white meat also? Sure! You’ll need to adjust the cooking time though since chicken breasts are larger. Could the chicken be fried in a deep fryer? I was thinking 350 for 6-7 minutes total cooking time. You are so welcome! I am happy to hear that you enjoyed it and the cilantro sounds like a great substitution! This chicken looks delicious! Do you have any idea how one might make it in an Airfryer? Maybe??? If not, no problem. I can try to figure it out myself. 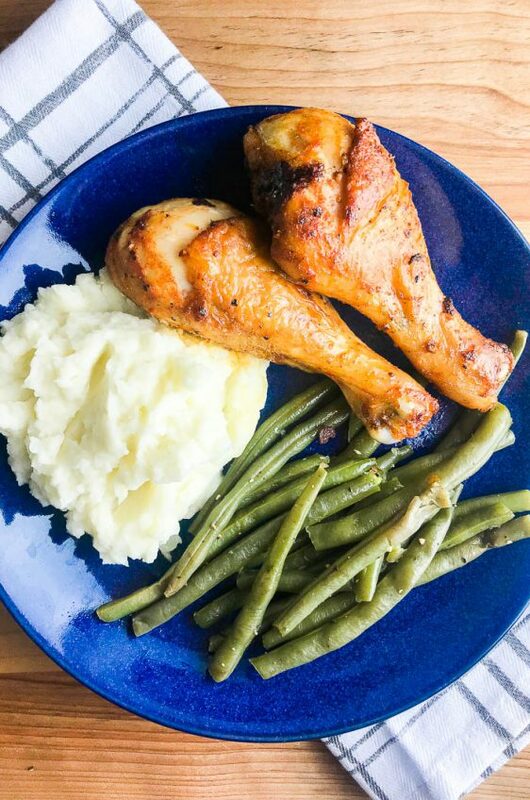 I received an Airfryer for Christmas, along with an Instant Pot, and it’s been so much fun learning new, quicker and easier (and healthier!) ways of cooking. Seriously craving this delicious looking chicken right now! My family wil love it! Wonder if I could bake it instead. Much healthier. You could certainly try to bake them. I would put a cooling rack on top of a baking sheet then put the coated chicken on top of that. By using the cooling rack, you can create some air circulation around the chicken while it’s cooking. I would then drizzle the chicken with avocado (or another high heat oil) and bake at 375 until golden brown and cooked through. You could then drizzle with the garlic oil. It might not be as crispy as fried, but I’m sure it will taste yummy too! My kids will surely love this! I can’t wait to try it! Oh, man! That garlic! 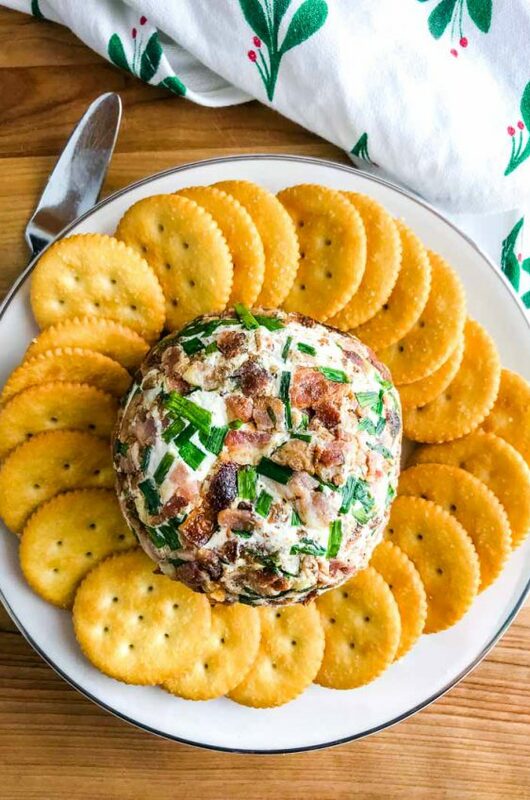 This looks super delicious — winner, winner, for sure! 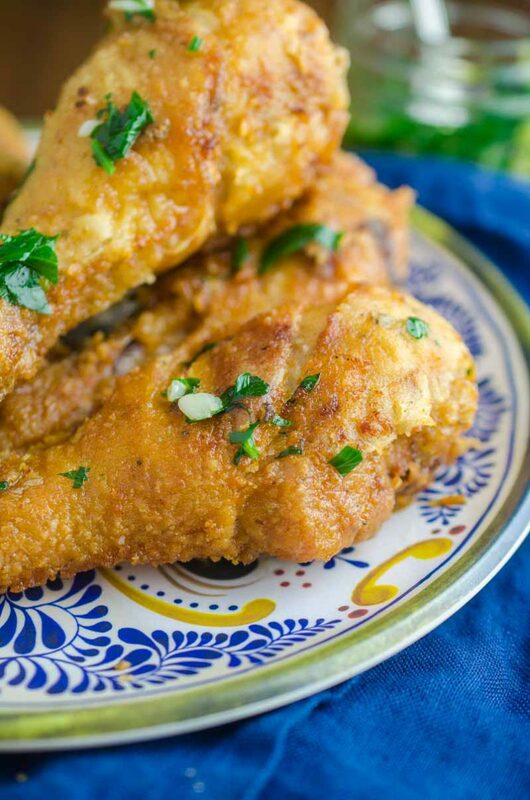 My husband is obsessed with fried chicken so this is definite going on the menu for next week! 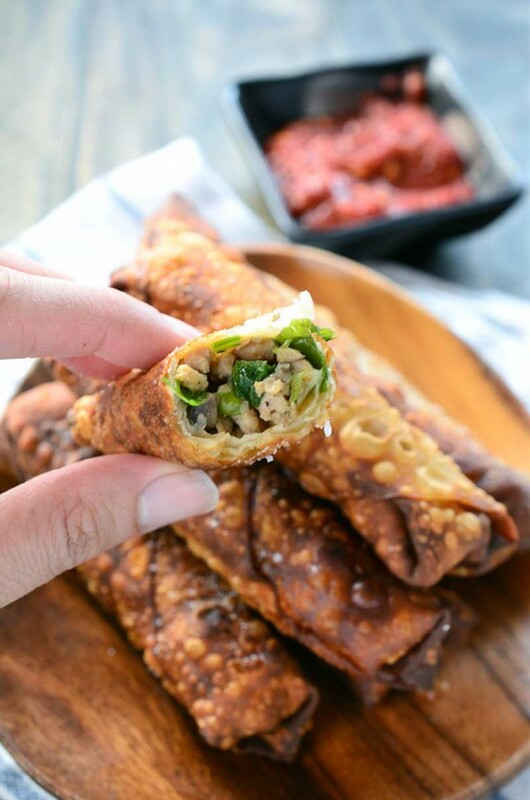 These look perfectly crispy and flavorful! That looks soooo perfectly crispy, yum! This fried chicken I could dig into daily! My husband would be so happy if this was served for dinner! Love the flavors together friend! This looks so good and easy too! I actually defrosted some chicken legs to make a thai peanut curry dish for dinner tomorrow, but it looks like I may have to change meal plans to give this a try! Thank you!